The backlash came swiftly. Some users responded in earnest, saying nothing in the image was out of the ordinary: this scene showed our present reality where bigotry had no place. Mostly, however, the internet, being the internet, turned the whole thing into a meme. Equal parts self-aware and defiant, people seized on the phrase “this is the future liberals want,” pairing it with increasingly ridiculous images until the original intent of the words became a self-roast of progressivism as well as an ironic parody of conservative outrage. 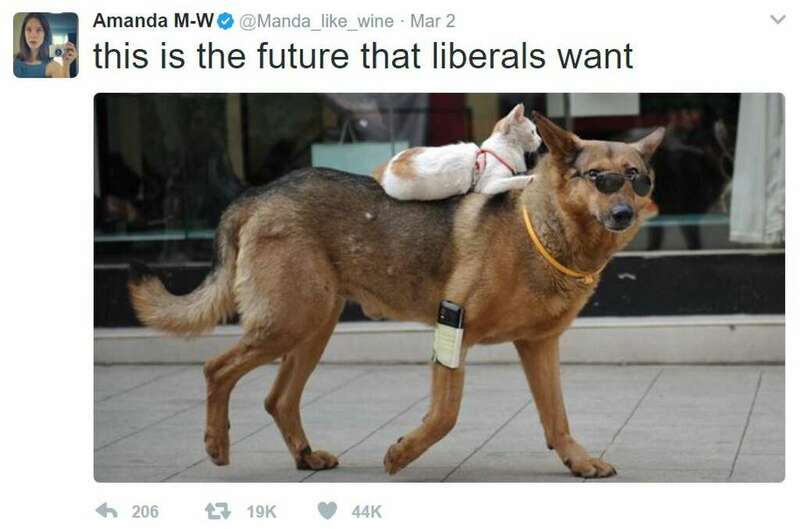 People seized on the phrase “this is the future liberals want,” pairing it with increasingly ridiculous images until the original intent of the words became a self-roast of progressivism as well as an ironic parody of conservative outrage. It was a perfect microcosm of liberal culture, a movement that is increasingly defined by Millennials. And as I listened to Jessica Shortall deliver her keynote at SXSW about empathy, bridge-building, and the forgotten art of walking a mile in someone else’s shoes, it was a phrase that kept coming to mind. What did Millennials do this time? It’s not what Millennials have done, rather what they're poised to do: make up the largest portion of the American workforce. This growing influence is drawing attention from across the board, especially as Millennial values, attitudes, and newfangled ideas about equality start to have real-world economic impacts. This fact is central to Shortall and her mission as the managing director of Texas Competes. The group, a coalition of Texas businesses, protests anti-LGBTQ+ legislation in the state of Texas by making the data-driven case that discrimination is bad for business. Shortall finds this conclusion obvious, stating Millennials find older generations “crazy” for still having to have these conversations. However, since there’s still a few years before Millennials fully take over the world (and ruin the napkin industry into the ground), Texas Competes is focusing mainly on data. Shortall isn’t shy about her love for data. Its role has been central to the success of Texas Competes, clearly showing the economic risk that can hurt businesses that discriminate against the LGBTQ+ community. While data has its benefits, cost-benefit analyses aren’t rooted in empathy nor are they a real commitment to creating safe spaces; a dependence on data dehumanizes a very human issue. Reaching that end-zone, though, is not an easy feat. It’s not enough to simply take measures to prevent discrimination, but to also take the next steps to actually become welcoming. Practice controlled empathy. Someone out there has opinions that are exact opposites of your own. Their core beliefs counter everything you stand for, and the worst part is, they too believe they’re completely in the right. Shift your reaction from wanting to attack them for their views, and instead focus on understanding what their sentiments are rooted in. Taking this first step back allows the conversation to be initiated and lays the foundation for the bridge. Never assume there are monoliths. Generalization of a group can lead to instant alienation. Just as a bridge runs two ways, it’s important to understand that the opposing group isn’t a faceless mass. Taking time to understanding nuances can help find unlikely allies and continue the task of building bridges. Develop an unrighteous strategy. A successful construction ultimately depends on attitude. Though being righteous can be tempting, effective strategy demands a humble and open mindset. Bridges are not built overnight, but with patience and initiative, they may be able to generate conversations for years to come. Throughout her presentation, Shortall covered broad strokes: how to overcome injustices to the importance of showing up and speaking up. It was presented cleanly, with minimal political context, which led to me to reassess my initial meme-based perception of her keynote. “This is the future liberals want” went viral for a reason. It started conversations. Yes, a cat riding a dog wearing sunglasses was not only fun to look at, it also started the bridge-building process. Without the meme, the tweet would’ve suffered the boring fate of being just another reactionary Twitter fight. Ultimately, Shortall’s talk served as a reminder that inclusiveness and tolerance are not exclusive to liberalism. At the end of the day, we all do better if we all do better. Moving forward to find common ground will never be an easy first step, but it’ll be a step toward a future that everyone—from Millennials to boomers to everyone—wants. Our Millennial series is not just for Millennials. Everyone can gain insight on these important workplace and life issues. Topics such as Millennials taking roles in customer service, finding a friend in feedback, moving up, while dressing down, and sweatworking impact us all, regardless of generation. Where can I get a killer taco? A guide to eating and exploring in Mexico City.